Home EDEN targetinvest What should you do to a share that is potentially RM 1.00 but now below 20 cents? What should you do to a share that is potentially RM 1.00 but now below 20 cents? Sometimes, when things appear to be too good to be true, most of the people will tend to take a conservative approach, but there are still people that are willing to take the front risk and plunge their money and invest into it. There are no right and wrong in such situation, because investment comes along with risk. But a lot of time, the too good to be true investment done with the right study and right research will bear good return when things start to get inline and things develop accordingly. Let's say, now I am telling you EDEN is too good to be true, will you want to believe? A share trading below RM 0.20 now, but with NTA at RM 0.77, but in fact the land asset can be holding up to more than RM 1.00 per share at the current market price. So actually, what is there to consider more? I had been talking and promoting on EDEN since it is 14 cents. Now it is 17 cents, which I think there is still plenty of room since we are talking about RM 1.00 here backed with land asset that is of strategic location, near to Kuantan Port, and also upcoming ECRL. This is a no play play issue because Land is a commodity, and it is strategic because the location is there, and this cannot be moved as you like because other infrastructure already in place, and that is the reason making the specific land to be strategic. Look again, 450 acre of land at Gebeng Industrial area, which is near to Kuantan Port. 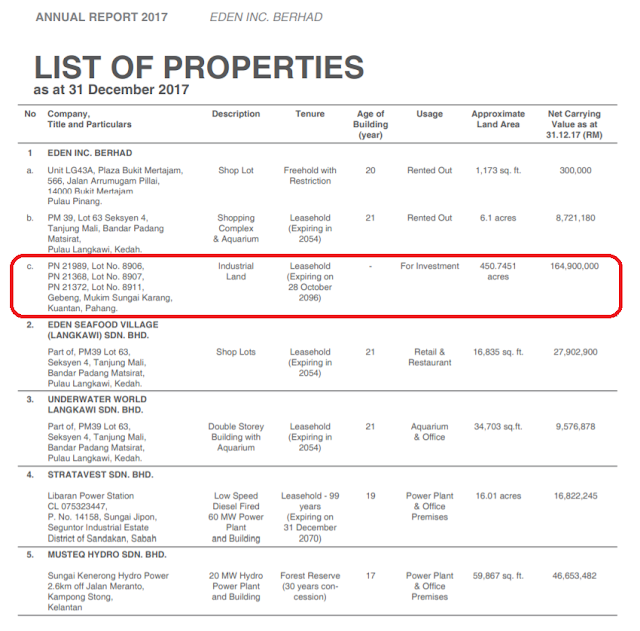 The recent transaction involving a 1.7 acre land is sold at RM 22 per square feet. This Kuantan Port will not be an ordinary port, because this port will be a very important port that will replace a lot of shipping activities that will be going pass Singapore. Technically, this area will be very sought after by international player, eyeing to have a piece of profit in this area. Many ship will stop at Kuantan Port, unload the container, and load into ECRL cargo train, go to Port Klang, and continue their journey. This will save cost, save time and also make Malaysia have more revenue. Now Alliance Steel already invested in Gebeng area. The MCKIP already attracted multi billion investment. All these investment will require huge factory to be set up, and that will involved purchasing of land and such. Since EDEN have 450 acre of land, some land will be acquire by ECRL, some land will be sold to 3rd parties foreign investor, or local business that are going to set up factory near to Kuantan Port. If you give 50% discount on RM 1.00, there is still RM 0.50. But the NTA is RM 0.77, so that is no kidding issue also.